An Unsettling Crime for Samuel Craddock by Terry Shames, a Mysterious Review. Review: An Unsettling Crime for Samuel Craddock, a prequel to this series by Terry Shames, is an introduction to how a young man survived poverty, an uncaring mother and father, and grew to graduate from high school, enlist in the Air Force, attend college graduating with a degree in geology, and ultimately becoming the youngest Chief of Police in the town where he grew up. The town of Jarrett Creek, Texas, population 3000, was divided by railroad tracks, one side was Dark Town where Negroes lived and the other side for the white residents. Samuel married Jeanne, the daughter of fairly wealthy parents from San Francisco. They were able to buy a nice home on the edge of town with acreage so they could raise cattle. Samuel hired Truly Bennett, a black boy, to help take care of the cattle when performing his duties as the Police Chief. When Samuel was called one morning to investigate a fire destroying a home out in a section of Cato Woods just outside of Dark Town, he was shocked. He didn’t even know a house had been built in the woods. Inside the still burning house they found five bodies: a woman, three teenagers and a boy about eleven. They had all been shot to death. In Texas there was a matter of what law enforcement agency would be given the case to pursue. It could either be the Texas Rangers, the Highway Patrol, or the Jarrett Creek Police Department. In this instance the Highway Patrol was given the case to take over. Unfortunately, Patrolman Sutherland who was in charge, was a racist and was looking to close the case with as little effort and evidence as possible. He quickly arrested Truly Bennett for no other reason than he was black and in the area. Now, Samuel must decide what his role was going to be in serving his city as the new Chief of police. He has been ordered by Sutherland to stay out of it. But Samuel is determined to see that justice is done, and he will do his own investigation to find the truth. This prequel does a fine job of presenting small town Texas life in the 80s. The murder mystery is interesting and well-structured, but more so the evolution of a young Samuel Craddock, who has become such a compelling series character (as shown in earlier books). Though prequels often feel disjointed to fans of series novels, this one is definitely worth reading. 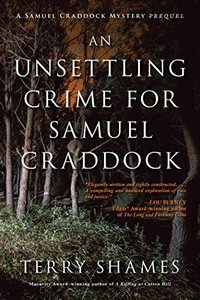 Special thanks to guest reviewer Betty of The Betz Review for contributing her review of An Unsettling Crime for Samuel Craddock. Acknowledgment: Seventh Street Books provided a copy of An Unsettling Crime for Samuel Craddock for this review.